In 332 BC Alexander the Great and his Greek army conquered Egypt from the Persians who were ruling Egypt. At first the Egyptians thought he would make them independent again, but he did not. Alexander made Egypt part of his own empire. 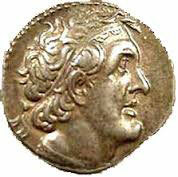 When Alexander died in 323 BC, his general Ptolemy (TA-low-mee; the P is silent) took over Egypt as his own territory. Ptolemy worked hard to make it clear that Egypt was now conquered by Greeks. Rather than settling in an Egyptian city like Memphis, Ptolemy had his capital in a brand-new city called Alexandria after Alexander. In the harbor of Alexandria, Ptolemy built a giant lighthouse to guide ships. This lighthouse, the Pharos, was one of the seven wonders of the world, and probably the tallest building in the world, for more than a thousand years. Ptolemy also used the tax money he took from the Egyptians to start a great university in Alexandria, like the ones at Taxila and Nalanda that the Buddhists were starting in India at the same time. The University of Alexandria was the home of the mathematician Euclid, who wrote the first geometrical proofs, the astronomer Aristarchus, who figured out that the earth went around the sun, Eratosthenes, who figured out how big around the earth was, and Archimedes, who worked out how levers work. These men all knew each other and worked together at the university in Alexandria. To help with the research, Ptolemy also started a big library in Alexandria, collecting books from all the ships that sailed into the port of Alexandria. Ptolemy and his successors (all called Ptolemy) ruled Egypt until the Roman Augustus conquered it from the last Ptolemy, the Pharaoh Cleopatra in 30 BC. The Greek Ptolemies succeeded in reconquering much of Israel and Syria, as the Egyptians had in the New Kingdom, and as the Philistines had before that. 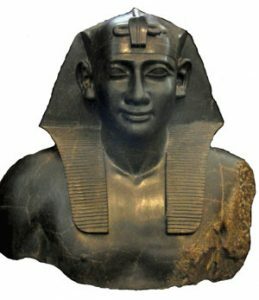 The Ptolemies brought Greek culture and the Greek language to Egypt and to Israel, though ordinary people continued to speak Egyptian and worship Egyptian gods. Egypt After the Pharaohs: 332 BC-AD 642: from Alexander to the Arab Conquest, by Alan Bowman (1996). A standard among historians, and pretty readable. Cleopatra, by Diane Stanley (reprinted 1997) . A biography of the last independent queen of Egypt, for kids. Women in Hellenistic Egypt: From Alexander to Cleopatra, by Sarah Pomeroy (reprinted 1990). Pomeroy is an expert on the lives of women in antiquity. The Hellenistic World and the Coming of Rome, by Erich Gruen (reprinted 1986). Cite this page: Carr, K.E. 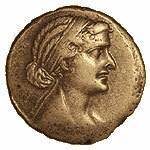 Ptolemies and Cleopatra – Greek Egypt. Quatr.us Study Guides, June 14, 2017. Web. April 21, 2019.